Background: Present study inspects the profiles of electric Dipole Moment (DPM) and polarizability (αp) of impurity doped GaAs Quantum Dots (QDs) in the presence of noise. Objective: Noise term maintains a Gaussian white character and it has been introduced to the system via two different pathways; additive and multiplicative. In view of a comprehensive analysis, modulation of DPM and αp has been scrutinized along with the variations of several relevant quantities such as electric field, magnetic field, confinement potential, dopant location, dopant potential, noise strength and aluminium concentration (only for AlxGa1-xAs QD). 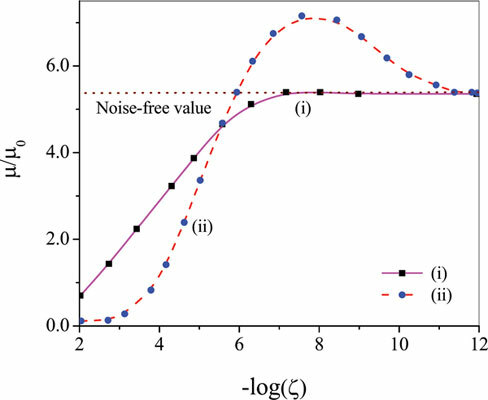 Methods: Application of noise almost invariably reduced the magnitude of αp and DPM from that of noisefree condition. However, the extent to which the said properties are altered depends on the noise strength domain and the pathway through which noise is applied. It can therefore be inferred that introduction of noise diminished the asymmetric nature of the system to a noticeable extent. Research: Moreover, the extent of drop in the asymmetric character of the system was found to be more with multiplicative noise than its additive analogue. Thus, the mode of application of noise also appears important in harnessing the polarizability and dipole moment of the system. Conclusion: The outcomes of the study delineate viable routes to tune the dipole moment and polarizability of doped QD system, particularly in presence of noise. Quantum dot, impurity, electric field, dipole moment, polarizability, Gaussian white noise.